My Farm in San Francisco will come to your house and install a vegetable garden in one day. They bring their own topsoil and compost, so even suboptimal soil in urban plots can still support vegetables. The cost: $500 to $1,800 for the installation, $50 to $250 per week for maintenance. The service includes a weekly visit for weeding, irrigation, and pest control. The people who live at the site of the garden can work on it themselves or can just let the farmer who comes once a week do all the work (and the farmer will leave a box of fresh vegetables on the porch.) Similar services are available in Portland and Seattle. I'm an indifferent gardener, gung ho in spring, bored by summer, overrun by weeds by mid-season. At the moment I plant things like rosemary and thyme which require no maintenance at all. I don't spend $50 to $250 a week on vegetables, so My Farm would be admirable but not budget concious for me. Still, I like it a lot better than hiring a gardener. Burger King recently launched a fragrance. Flame cost $3.99 a spray bottle and apparently smells of smoke and flame broiled meat. Alas, it sold out and is currently going for $100 in the Buy It Now category on Ebay. The body spray was not available at Burger Kings. It was available at Flame Meets Desire, a website featuring romantic images--roses, candles, someone pouring a glass of Freixenet, a sparkling cava that I like but which is essentially cheap champagne, and most terrifying of all, the Burger King guy (weird fiberglass head on male model body) lying on a fur in front of the fire, a fur draped strategically across his pelvis, beckoning. It was also available in an exclusive deal at Ricky's, the New York City drugstore. I am willing to be convinced that food could be a fragrance. My husband is drawn to the kitchen by the scent of onions and garlic sauteing. Walking through a store, I find the smell of birthday cake draws me to the bakery. Flame broiled meat does seem like a possible aphrodisiac, redolent (if you'll pardon the pun) with suggestiveness. But fast food? It's a terrifying world. I was reading some chapters from Malcom Gladwell’s Outlier. Gladwell cites research that indicates that more than talent, what it takes to become truly competent at a complex skill like, say, concert violin, is practice. Researchers couldn’t find evidence of people who became symphony orchestra level competent who hadn’t put in horrendous amounts of practice, no matter how talented. In fact, the magic number seems to be about 10,000 hours of practice. This is, apparently, a necessary but not sufficient thing. That is, you won’t attain true competency without the 10,000 hours of practice, but you can put in the ten thousand and not attain competency. Although apparently, that’s pretty rare. He has a lot of complex and interesting things to say about this phenomena and the book is a really fun read. What it got me thinking about, of course, is my area of interest, fiction writing. In fiction writing, there seems to be a sense that on average it takes about ten years to get published. This turns out to be pretty accurate in my case. I got really serious about writing when I was nineteen. I published my first story when I was 29. Last night I was lying in bed thinking about my writing habits and I figure I wrote about twenty hours a week, much of that time. Most of it on weekends. I didn’t have a real job. I didn’t have a serious relationship. I didn’t even have a couch. I had a series of temp jobs and a typewriter. Eventually, a computer. When I crunch the numbers, it comes out somewhere around 10,000 hours. That, for me, was just to get competent. There are other ways that writing people say this. I was told that everyone has 100,000 words of crap in them that they have to write first. I explain to my students that in my case this was not true. I had about a million words of crap. But probably, what I had was 10,000 hours. There are lots of exceptions to this, people who publish at seventeen. But my sense is that publishing too early is not actually a good thing. I’ve had people at Clarion who published fairly early in their practice of writing (which is different than their age) and it often seems to me that they wrote a story that was something of a fluke. They have the sense, rightly, that there was something about the story, a kind of gimmick, that got it published. They are often looking for more of the same, trying to find the twist, the idea, the ‘thing’ that makes the story publishable. Flukes are a hard way to sustain a career. I think that an early publication and years of failing to follow up can actually be soul destroying. This also explains to me why some of my older students, who have so many things I think are important to being a writer—something to say, a strong sense of story and a large depth of reading—still struggle. Intelligence is necessary, but not sufficient. They also need 10,000 hours of practice to get to the point where they are competent to solve the hundred little problems a page that a piece of fiction demands of the writer. Things like, how much to explain, how much to explain in the narrative, how much from the character, how to get the character out of the kitchen and to the scene of the fire. For a competent writer, the way they do these things is intuitive. I don’t tend to think about how much of the narrative is from the narrator and how much from the character. I’m not even aware that I’m making those decisions. Neither is the unpracticed writer. The difference is that after years of practice, I have a set of unconscious skills that tell me what is more likely to be successful. I know when it ‘feels right.’ For me, only after 10,000 hours could I actually start to think about a lot of the decisions I made to solve those problems. Before that, like learning to ride a bicycle, if I thought too much, I fell off. The prose got stiff, overly self-conscious, mannered in a bad way. I’m wondering now what a second 10,000 hours does. And a third. Does it make a difference that I started writing seriously at nineteen? 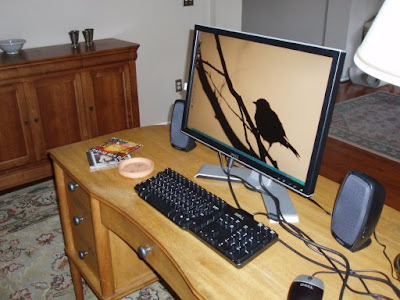 Would I be able to start writing seriously now, at fifty, and at sixty produce something competent? I think so, although I’m not sure. I’m pretty sure it, and I, would be different than what I will produce at sixty now. The practice shapes me as much as I shape the practice. What does it take to lose competency? At some point, most of us begin to decline. Can that 10,000 hours of practice be wasted, lost, misplaced? Certainly by things like a stroke. What does disuse do? It is a strange life, the life of someone, a programmer, a physician, a pilot, whose job depends on just this kind of practice. A race between getting in the hours and the lose of capacity. 10,000 hours. Had I known what it would take, I don’t know that I’d have ever made it. Never the most prolific of bloggers, I am bound to become even worse now. For Christmas, Bob got me a video game called The World of Goo. If you are old enough to remember Lemmings, let me just say that World of Goo is funnier and quirkier and more charming. It's a puzzle game. It does not involve shooting zombies. It's from a small independent gaming company, and it's winning tons of awards. It's addicting. First, I would like to say, we are still happily married. Second, the cookies are fabulous. We made different styles of cookies, as befits our personalities. 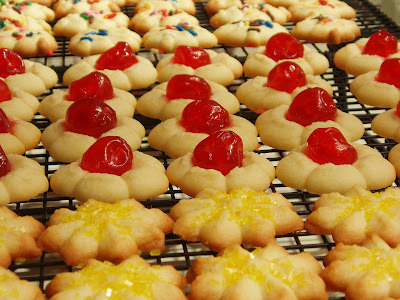 Bob saw a cookie press and got excited--when he was a kid, his mother would use a cookie press to make cookies that he and his brother would decorate. A cookie press, if you don't know what it is, is basically a caulking gun for cookie dough, with a circular cut out at the end, so the dough shapes stars or Christmas trees or hearts. The dough is a gorgeous sweet butter cookie dough. We bought sugar and sprinkles and icing and Bob extruded dozens of cookies. I am making Christmas cookies for a cookie exchange. (I'm hoping at least one other exchanger will post photos, and if they do, I will add a link.) 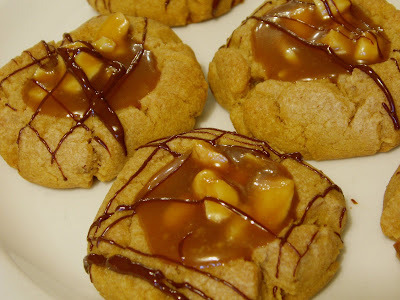 Several weeks ago I saw a recipe for peanut butter caramel cookies and wanted to try it, despite the intimidating 'making caramel from scratch' factor. So I did, and I think they came out well. The writer/cook seeks to create something that I imagine, hoping it will taste unexpected and good. The peanut butter cookies are pretty good. We're both pretty happy. And not hungry for dinner. I have a sad preference for melancholy Christmas songs. And I have always loved this song in that stupid way that happens when you hear a version of a song before you have any critical faculties at all. And although I am not a U2 fan, this is a lovely cover. "Of course, everything, in every novel, is artifice." I just got new glasses. 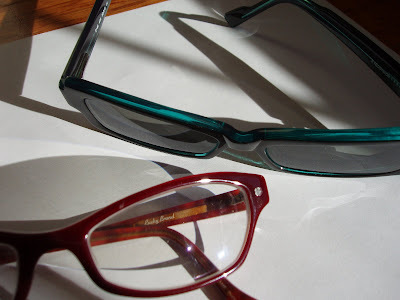 Regular glasses and sunglasses. It has been awhile since I got glasses--I tend not to get them until I'm having trouble. When I was a kid, I got very nearsighted before anybody figured out I needed glasses. (Not as nearsighted as my sister. When they finally hauled her to the optometrist, he said, 'Read the third line on the chart please?' and she said, 'What chart?') I remember walking out of the optometrist's office and suddenly, all the trees ended instead of fuzzing off into the sky like smoke. The trees are sharply defined again. I can read highway signs at night. My new glasses are very cool. Jen from my writer's group suggested that they would be cooler if they shot lasers and that is undeniably true. But apparently our insurance doesn't give us $50 off frames that shoot lasers. Probably just as well. Tomorrow night's dinner is Italian. I started baking--Bob's favorite ginger snaps, which are an old German recipe that uses ginger, cinnamon and black pepper, little sparkling lemon cookies. 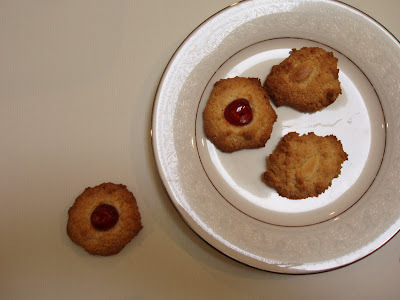 I was still looking at cookie recipes and came across a recipe for amaretti, the crisp little almond cookies of Italy. Last night, I realized I had forgotten an ingredient for the lemon cookies I was making, so while i was at the store I figured I'd buy the almonds and the glaceed cherries for the amaretti. I found almonds of course. But I couldn't find the glaceed cherries. Glaceed cherries are those cherries that go in fruitcakes. They come in red and green and don't bear much resemblance to anything natural, like, you know, a cherry. I don't much like them, but on top of a little almond cookie, they're probably pretty good. It's December. It's fruitcake season. I can't find the fruitcake stuff. My first thought is that maybe people in Texas don't make fruitcakes. I don't think fruitcakes are very Latin American, and a lot of our sweets tend in that direction. But seriously, Texas is really kind of part of the south, and the south is really serious about it's fruitcake. Usually soaked in bourbon for six weeks. (I figure this is because a lot of people, me included, don't like fruitcake.) I ask in the bakery and the girl says she's sure they have them and sets off with me in tow to find them. I protest I can look but she says she works in the bakery section and people will ask her to it's good to know. It takes us three store employees to finally find the fruitcake section, but we finally do and there we find the red cherries, the green cherries, the candied pineapple. The employee who knows where to look casually mentions that it used to be a lot bigger. I keep assuring people that I am not making fruitcake. 'Cookies' I say. 'I making cookies. Not fruitcake.' I don't know why I am worried that someone will think I am making fruitcake. It's not like fruitcake is only made by deviants. Even in Texas. But there are all those fruitcake jokes, about the fruitcake that circulates endlessly, re-gifted over and over. This morning I get up and look at the recipe and it calls for blanched whole almonds. The store had whole almonds and blanched slivered almonds and I got whole almonds. Which are not blanched. I can tell because the almonds in the picture are almost white, and mine are brown because they still have the skin on them. I think about going back to the store. I am still wearing my pajamas and I don't really want to go to the store. I am intrepid in the kitchen. I make weird stuff all the time. From scratch. Maybe I can blanch almonds. I check the internet and it says that if I soak my almonds in boiling water for one minute, 'the skins will slip right off.' But don't soak them for more than a minute because then they won't be crisp. Yeah. Boiling water. I can boil water. I boil water. I soak my almonds for exactly one minute. I need two and a quarter cups of almonds. Skinned. It turns out that's a lot of almonds. It takes me an hour to skin two and quarter cups of almonds. For one thing, the skins don't 'slip right off.' They resist. I think a lot about when I was growing up and my mother got the idea that we should harvest the walnuts from our walnut tree. (We usually left them to the squirrels.) That was the year I found out that walnut husks were used by the pioneers as a dye. And that it also dyes the skin of your hands. At least almond skins don't make my hands turn brown. 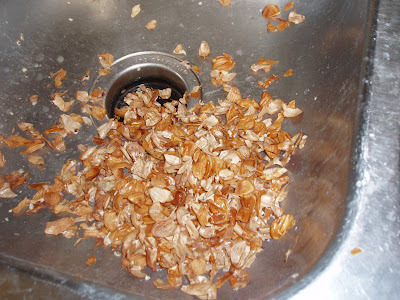 The dead almond skins collect in my sink. The cookies are really crunchy and good. They really taste of almond. I'm pretty sure they would taste just as almondy if I had bought blanched almonds. There are things that you can do, but don't really need to. 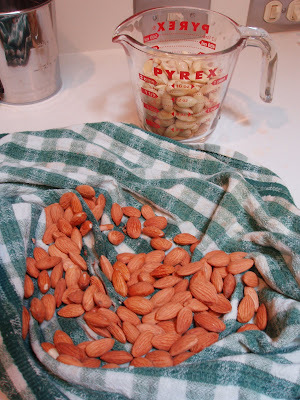 Blanching almonds is one of those things. If you find yourself with two cups of whole almonds when you need blanched, go to the store. Buy the blanched. This is really scary. Or really funny. Depending on how much irony is involved.